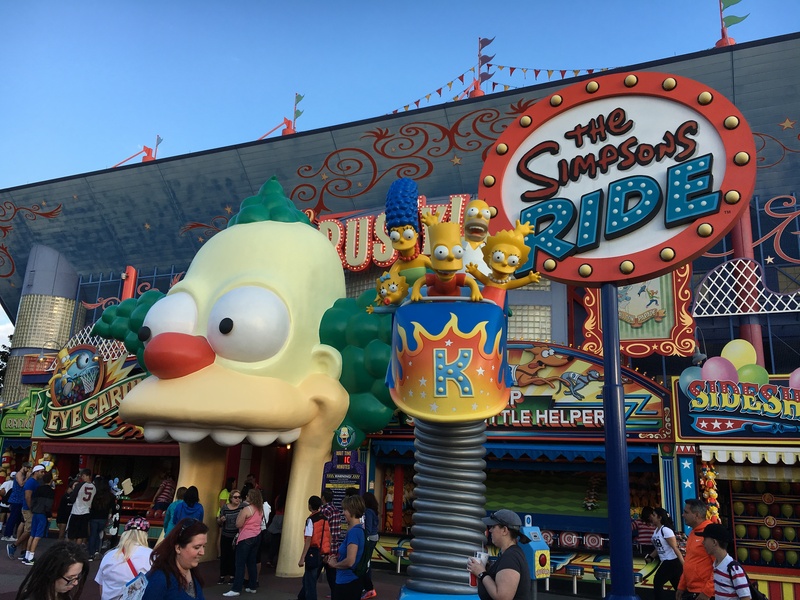 Ride along with The Simpsons as they visit Krustyland, the theme park created by famed TV personality and shameless product huckster Krusty the Clown. Is somebody out to sabotage the park? You'll find out as you join Homer, Marge, Bart, Lisa and Maggie and enter through the carnival-like midway. Once you board your vehicle you're in for one surprise after another as you embark on a wild, over-the-top ride through the park... flying, floating, and more or less crashing your way through Krustyland's kiddie attractions, stunt shows, and thrill rides. Be sure to keep an eye out for many of your favorite characters from the TV series in this all-new animated adventure, which takes you through Springfield and beyond... it's the first-ever attraction based on the show! This motion simulator can be a little jerky in places, but should be fine for most ages. Don't ride if you have serious neck or back problems. 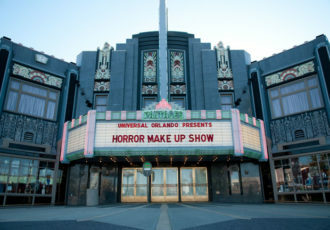 Before it was transformed into The Simpsons this ride system was used for the Back to the Future Ride, and the new pre-show pays homage by showing Doc Brown losing the lease to the building to Krusty the Clown... and he was actually voiced by Christopher Lloyd. State-of-the-art digital projectors cover an 80 ft. diameter dome surface with an image four times the standard High Definition found in most home theaters, and twice what you'd experience in a normal digital theater.